Carole E. Scott cscott@westga.edu is the editor of B>Quest. "Of the forty-three scientists who, since 1912, have contributed most to radio's scientific development and progress, only two have received compensation in any way commensurate with their achievements. We have here a complex and serious economic phenomenon. Great discoveries are made and the discovers profit little. The public which owns the ether...profits little. A third party steps in and, discovering nothing, inventing nothing, and owning nothing, nevertheless, makes great fortunes." The fruits of scientific discovery over the centuries became a part of our everyday lives as a result of decades of work by inventors and entrepreneurs scattered across the world. Many scientists were not inventors, and many inventors were not entrepreneurs, either because they were not capable of or were not interested in attempting to fill more than one role. The history of the development of the radio industry from which today's high-tech entrepreneurs may draw some lessons illustrates that a new, technologically-based industry is like a coral reef. The top, living layer of coral rests on a large body of material laid down over the eons. Likewise, the technologically-based industry rests upon a large body of scientific and technological knowledge accumulated over the centuries. As had been true of an earlier high-tech industries such as the telegraph and electric lighting in their formative years, what was accomplished early years in the radio industry was primarily brought about by inventor/entrepreneurs. The early history of radio is a story of individual inventors and entrepreneurs, many of whom were both inventors and entrepreneurs. However, after 1920 this industry's history is largely one of organizations. Of the four chief players in American radio's early years, Guglielmo Marconi, an Italian inventor/entrepreneur, and American inventor/entrepreneurs Fessenden, deForest, and John Stone Stone [sic], only Marconi "grasped and exploited the interdependence among technology, business strategy, and the press." [G. Douglas 100] Only Marconi had an adequate business strategy. Only Marconi and deForest took full advantage of the press. However, deForest seems to have used the press more to sell stock than apparatus. Marconi was also more astute in his patent dealings than were his American competitors. For example, to protect himself from a possible patent suit, he purchased from Thomas A. Edison his patent on a system of wireless telegraphy (transmitting dots and dashes through the air) that Edison had never used. Marconi never used it either because it was inferior to one he had developed. The inventor/entrepreneur did not cease to be an important figure in the radio industry until after World War II. The last of inventor/entrepreneurs to play a major role in the radio industry was Edwin Armstrong, the inventor of FM. In the face of fierce opposition from the Radio Corporation of America (RCA) with which he had previously been associated and at the cost of both most of the fortune he had made in radio and, apparently, his life (suicide), he was eventually able to establish a frequency-modulated (FM) radio industry. FM represented a great improvement over amplitude-modulation (AM) radio because of its greater fidelity. RCA's unwillingness to continue to assist Armstrong was due to the fact that its head, David Sarnoff, believed that more money was to be made by putting RCA's money into television. Even as early as the 1920s many were convinced that corporate research laboratories had made individual inventors like Marconi and Armstrong obsolete, but Idaho farm boy Philo Farnsworth proved then wrong. He was just a high school student in 1922 when he outlined for his amazed physics teacher his idea for an electronic television system. (Up to that time experiments had utilized unsatisfactory mechanical methods for transmitting a wireless image. Charles Jenkins first publicly demonstrated this type of television in 1923.) As a college student Farnsworth convinced a professional fund raiser that he could produce a commercially viable television system, and to the surprise of many, Farnsworth, rather than one of the large radio manufacturers, became RCA's strongest rival in the race to produce a commercially viable electronic television system. For the turn of the twentieth century generation, the first transmission of a Morse code message through the air was an awe-inspiring, near miracle. Ultimately this new medium, radio waves, was to have a huge effect on what people thought, the way they talked, and what they bought. However, as was later to be true of television and, perhaps, will be true of the internet, radio failed to live up to the early, highly visionary hopes for it. It did not end war or dramatically raise the general cultural and educational level as some visionaries forecast. Nonetheless, its achievements were impressive. When radio burst upon the scene GE and its smaller competitor, Westinghouse, were circling each other like boxers looking for an opening. There were two ways one of them could "knock out" the other. One was painful, price competition. The other and more commonly resorted to was either to invalidate their competitor's patents or convict him of infringing on theirs. By 1896, there were over 300 patent suits pending between GE and Westinghouse. Ultimately these companies decided to "throw in the towel" and collude via a patent pool that achieved the same end that illegal collusion would have. Most of the scientific discoveries necessary for the invention the radio and television industries were made well before the twentieth century commenced. Most of them were made by Europeans. Radio and television, like all the other electrically-based industries, can trace their ancestry all the way back to 699 B.C., when the Greek philosopher Thales observed that after it is rubbed, amber (elektron in Greek) attracts small objects. Discoveries that led to sending pictures via radio waves were made simultaneously with those that led to sending sound by them. As early as 1267, Giovanni Battista della Porta, also an Italian, conceived of sending messages via magnetism. Hundreds of years later an Englishman, Roger Bacon, and an American, Benjamin Franklin, speculated that electricity could be used to transmit messages. The theory of light and electric waves was developed by an Englishman, Michael Faraday (1791-1867). In 1831, an American, Joseph Henry, developed the first efficient electromagnet and used it to tap out messages between buildings on Princeton's campus. Inspired by this unpatened work, an American, Samuel F. B. Morse, developed and patented a successful telegraph. An art professor, the lure of the wealth to be made by developing the telegraph led Morse to become an inventor. The government's refusal to pay him for his invention and develop it caused him to become an entrepreneur. Morse he knew the value of publicity and was good at obtaining it. Faraday's theory led to the discovery in 1877 by Heinrich Rudolf Hertz, a German, of the electromagnetic waves now called radio waves that were originally called Hertzian waves. In 1885, an American inventor/entrepreneur, Thomas Alva Edison, took out a patent on a system of long-distance telegraphy without wires. Before the end of the nineteenth century, Guglielmo Marconi, an Italian inventor/entrepreneur, using a much superior system, transmitted Morse code through the air over a modest distance over land in Italy. Then he duplicated this feat between Canada and Great Britain. Thus was the seed of an industry planted. Because it had obvious commercial and military value, in Marconi's day a number of men throughout the world were seeking to develop wireless communications. Many governments promoted wireless experiments by their citizens. In Russia, Aleksandr Popov, who developed the first true antenna, demonstrated a wireless receiving set in 1895. Marconi's great discovery was that an antenna could also be used to transmit electromagnetic radiation, that is, it could also be used to transmit Hertzian waves (radio waves). Prior to this discovery, a wireless (radio) signal could only be sent a short distance. Like American pioneers Lee deForest and Edwin H. Armstrong, Marconi decided to become an inventor at an early age. 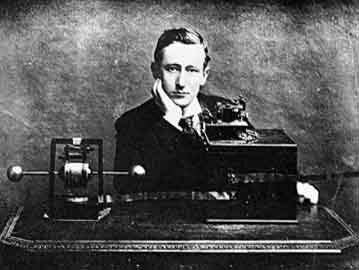 Marconi's obsession with utilizing Hertizian waves as a communications medium began in 1894. Marconi, whose inherited wealth and connections gave him a big advantage over others experimenting with radio waves, is, despite his many inventions, generally considered to have been more of an entrepreneur than an inventor. The son of a wealthy Italian and the daughter of a wealthy, Irish-whiskey-distilling, Scots-Irish family, Marconi never attended college. However, his mother used her influence to have him tutored by a physics professor working on Hertzian waves. Aided by his mastery of the English language and the influence of his mother's family, he was able to gain backing for his experiments in England. As Marconi was later to explain, "I first offered wireless to Italy, but it was suggested, since wireless was allied with the sea, it might be best that I go to England, where there was greater shipping activity, and, of course, that was a logical place from which to attempt transatlantic signaling. Also my mother's relatives in England were helpful to me." [Dunlap 48] (Early radio signals could travel great distances only over water, and the telegraph could not compete with it there as it did on land.) Armed with a letter of introduction, Marconi approached the British Post Office's Chief Engineer and was invited to give demonstrations of his apparatus for sending dots and dashes (Morse code) to both the Post Office, which had a telegraph and telephone monopoly in Great Britain, and the British army and the navy. While Marconi remained absorbed with transmitting dots and dashes from point to point, others began to think about broadcasting music and speech. In 1900, a talented Canadian-American physicist, Professor Reginald Aubred Fessenden, first transmitted speech by wireless. Like Marconi, he used a spark-gap-transmitter, which produces short bursts of waves, that is, discontinuous or interrupted waves. Discovering that high quality transmission of speech and music is not possible using this system, he switched to using continuous waves. Once the problem of finding a way to transmit voice and music by radio was solved by Aubrey Fessenden, the development of a viable radio broadcasting industry became possible once the triode vacuum tube was developed. As a detector of radio waves it was much superior to the coherer used by Marconi. (The coherer was invented by Oliver Lodge and improved upon by Marconi.) The story of the triode tube began when, in 1904, John Ambrose Fleming, an English electrical engineer, made use of what was called the Edison effect after its American discoverer, Thomas A. Edison, to invent the diode tube. In 1906, American inventor/entrepreneur Lee deForest added a third element to this tube; thus creating a triode tube that could both detect and transmit radio waves. He called it the Audiron. Terribly outdated well before the twentieth century's end, nonetheless, this was one of the most important inventions of the century. In 1916, U.S. courts ruled that deForest had infringed on Fleming's patent, and that Marconi had infringed on deForest's patent. This decision meant that neither deForest or Marconi, who had purchased Fleming's patent, could use the triode tube. Until the stalemate created by this and other patent conflicts could be settled, which did not take place until after World War I, a broadcasting industry could not be created. During World War I the uses to which the military put radio made governments more appreciative of its value, thereby spurring its development. Technological break throughs, too, were achieved by servicemen. For example, while serving in the U.S. Army's Signal Corps, Edwin H. Armstrong developed the super heterodyne that made it possible to replace earphones with a loudspeaker. Obviously, this was a major breakthrough. John Stone Stone (1869-1943), whose unusual name was due to the fact that his mother's maiden name was Stone, was a graduate of Johns Hopkins University who began his career as a telephone engineer with the American Bell Telephone Company of Boston. He revolutionized spark telegraphy in the United States. (Spark telegraphy is what the method for transmitting dots and dashes was called.) In 1899, he set himself up as a consultant. Wireless telegraphy soon became his chief area of work, and in 1900 he applied for and received a tuning patent. This was over a year before Marconi applied for a tuning patent. In 1901, he founded the Stone Wireless Telegraph Syndicate. 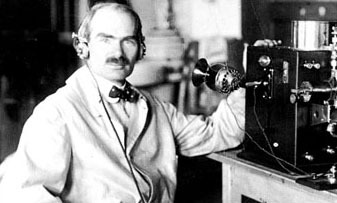 In 1912, John Stone Stone and his friend, Lee deForest, demonstrated deForest's Audion tube to American Telephone and Telegraph engineers. In addition to technical problems, Marconi had to contend with competitors and hostile governments. The British government had no intention of letting him threaten the Post Office's monopoly, and it ceased being helpful to him after he allowed his cousin to form the Wireless Telegraph and Signal Company in 1897. Both this company and its American subsidiary lost money for many years before they turned a profit. One of the reasons his company fared relatively well is that he hired able men to manage it. Barred by law from equipping many of the world's navies and prevented in Great Britain and other countries from providing a message service ashore because this was a government monopoly, Marconi had to turn to providing communications to ships at sea and between continents. In the latter business he had formidable competition. Transatlantic communication was then the preserve of a British cable cartel that did not relish wireless competitors muscling in. For many years, in Marconi's view, wireless was simply another way to convey a message from one party to another. He assumed that if wireless could be made to send signals far enough reliably enough it would be very competitive with cable for transoceanic work. Its competitiveness lay in the fact that the cost of constructing, operating, and maintaining wireless stations was much less than the cost of laying, operating, and maintaining underwater cables. Though cheaper than cable messages, a wireless message was inferior to a cable message because it could be more readily intercepted. This significantly limited how much business wireless could take away from cable. Marconi had two "arrows" in his business "quiver." He both provided a message service and the apparatus needed to send and receive wireless messages. Marconi's first apparatus sales were to the world's navies and merchant marines. The sinking of the Republic in 1910 sparked interest in the equipping of ships with wireless, but it was the sinking of the Titanic in 1914 that resulted in "what had been a scientific curiosity" being raised "in a few tragic days to the status of a necessity." [Lyons 60] Subsequent to the Titanic disaster, the U.S. Congress made it mandatory for ships carrying more than fifty people install a radio and monitor it twenty-four hours a day. Marconi gave demonstration after demonstration. He installed equipment on a speculative basis. But, despite his lead on his competitors and his tireless and difficult pursuit of an international wireless monopoly, he was unable to achieve monopoly status. The fact that this quest often required the defense of his patents and attacks on others' patents illustrates a negative side of the patent system, for while the granting of a temporary monopoly provides an incentive to invent, even the potential of resulting monopoly profits leads to sometimes huge legal costs. Conflicts over patents, which was frequent in the early days of all branches of the electric industry, retarded progress. The American Marconi Company's initial refusal to sell its apparatus, and its insistence on providing men to operate it incensed the U.S. Navy, which did not want to use equipment owned and operated by a predominantly foreign-owned company. (Later IBM would antagonize customers by refusing to sell its computers and, like Marconi, would be forced to change this policy.) The U.S. Navy became even more dissatisfied about the American Marconi company's foreign ownership after World War I broke out and the British cut America's cable connections with Germany--a country the U.S. was not yet at war with--and censored messages on still intact cables. The Navy responded by building its own shore stations, equipping them with radio transmitters and receivers purchased from Lee deForest, other Americans' firms, and a German firm. Marconi did not consider broadcasting entertainment until 1916, when his employee David Sarnoff recommended that his company engage in it in order to sell the public "radio music boxes" that it would manufacture. This proposal, like Sarnoff's plan decades later for RCA to introduce television, was shelved as the result of the outbreak of war, the First and the Second, respectively. (Television broadcasting commenced in Great Britain and Germany prior to its inauguration in the U.S. after World War II ended.) Sarnoff realized that the real money lay, not in broadcasting, but in producing sets for people to listen to broadcasts with. Marconi did not become a pioneer in broadcasting despite the fact that in his day the telephone had been used to transmit entertainment as well as messages. By 1895, for example, some opera houses in Europe were equipped with either stereo or monophonic telephonic systems. In Budapest, Hungry there was a system established in 1893 that provided regular news and music programming up to twelve hours a day. A like service did not appear in America until over a decade later. However, in 1894 the Chicago Telephone Company broadcast by wire local election returns to, it was estimated, over 15,000 persons. [Sivowitch 18] These early forerunners of today's cable television were not very satisfactory because loudspeakers had yet to be invented. Marconi may not have been visionary enough to found the broadcasting industry. Vision was required because, while there was already an established market for electronic, point-to-point communication and a theoretical and technological basis for developing a new way to serve it, there was no existing market for broadcasting, nor could the technology for transmitting speech be as easily developed as could that for transmitting dots and dashes. Due in part to the Marconi Company's purchase of competitors who had infringed on its patents, by the time World War I broke out, the American Marconi Company dominated the American radio market; so it had no overwhelming need to develop a new service. In addition, Marconi had no surplus funds to plow into a new business. Shortly after the end of World War I, the U.S. government 's hostile attitude convinced Marconi that his company had no future in America, and he agreed to sell it to GE. To make possible, it was claimed, the production of the most technologically advanced apparatus and a complete radio system, GE's Owen Young put together a patent pool consisting of GE, Westinghouse, American Telephone and Telegraph Company, United Fruit Company, and a newly-created and jointly-owned firm composed of American Marconi's assets, the Radio Corporation of America. (Subsequently, RCA would create the National Broadcasting Corporation.) Formed in 1919, RCA, which originally had a government representative on its board of directors, was supposed to become an international communications monopoly that would sell radio apparatus produced by GE and Westinghouse. Although it became the dominant company in the radio industry in the U.S., it fell short of achieving even a domestic monopoly. It took little more than a decade for the federal government's policy towards RCA to reverse, and in 1930 the Department of Justice charged RCA with using its portfolio of patents to restrain competition. This antitrust action dragged on for almost thirty years. A pioneer in wireless communication and fluorescent lighting, in 1891 he invented the Tesla coil which was widely used in radio and television sets. In 1943, the Supreme Court reversed a decision made by a lower court decades earlier that had rejected Tesla's challenge of Marconi's basic radio patents. It invalidated Marconi's patents on the basis of their having been anticipated by Telsa's work. In 1885, he sold the patents to his alternating current system to George Westinghouse, head of the Westinghouse Electric Company, who used Tesla's system in 1893 to light the Columbian Exposition in Chicago. In 1896, Tesla installed the generating equipment that carried power from Niagara Falls to Buffalo, New York. His advocacy of alternating current for the transmission and distribution of electricity to homes and factories incensed his first American employer, Thomas Edison, who had blundered by choosing to use direct current. Edison mounted a smear campaign against Tesla and alternating current, which he said was unacceptably dangerous. To prove that alternating current was not too dangerous to use, Tesla allowed it to flow through his body and light a lamp he held in his hand. Although the nation was electrified with alternating current, this did not make Tesla a wealthy man because, when Westinghouse said that the financial burden of his contract with Tesla endangered his company, Tesla tore up the contract with his friend. His failure as an entrepreneur wasn't because he was unable to get attention, as he attracted a great deal of press coverage because even the claims that he could back up seemed very wild at the time. He backed up one claim by demonstrating a boat guided by remote control in Madison Square Garden. Photographs were taken of his man-made lightning, which included flashes as long as 135 feet. He received the highest honor that the American Institute of Electrical Engineers awarded, and among his few friends were some prominent writers, including Mark Twain. However, unlike Edison and Marconi, he was never able to obtain the financial support he needed to make his company a success. He did manage to get financier J. Pierpont Morgan to loan him $150,000 to begin building a radio tower on Long Island from which he expected to provide communications world wide. He had to abandon this project when Morgan withdrew his support. Subsequently, for lack of money, many of his ideas never got beyond his notebooks. The time was Christmas 1906. The place was a banana boat wallowing in the Caribbean. Its radio operator sat hunched over, pressing his earphones against his ears, straining to hear a faint signal from far away Brant Rock, Massachusetts. (The above picture is a circa 1906 view of the Brant Rock station.) He was listening, not for the normal dots and dashes, but for a voice and music. Thus was born radio broadcasting, Reginald Aubrey Fessenden's Christmas present to America. Fessenden, a very prolific inventor, first experimented with voice transmission while working for the United States Weather Bureau. In 1900 he left what is now the University of Pittsburg, where he was head of the electrical engineering department, to develop a method for the U.S. Weather Bureau to transmit weather reports. That year, through the use of a transmitter that produced discontinuous waves, he succeeded in transmitting speech. Although discontinuous waves would satisfactorily transmit the dots and dashes of Morse code, high quality voice and music cannot be transmitted in this way. So, in 1902, he switched to using a continuous wave, becoming the first person to transmit voice and music by this method. Unhappy with the U.S. Weather Bureau, Fessenden formed his own company, the National Electric Signaling Company. The 1906 broadcast was heard by ships as far away as the West Indies. This broadcast was announced in advance so that people would try to pick it up. This experiment was a major breakthrough in superimposing voice and music on a high frequency carrier wave. The United Fruit Company, whose ships picked it up, was sufficiently impressed to place an equipment order with Fessenden's company. Because he did not provide a regular schedule of programming for the public, Fessenden is not usually credited with having operated the first broadcasting station. Nonetheless, he is widely recognized as the father of broadcasting because those had gone before him simply delivered messages from one person to another. However, despite being preoccupied with laboratory work and being unsuited by temperament and experience to be a businessman, he chose to directly manage his company. It failed, and an embittered Fessenden left the radio industry. Lee deForest, whose doctoral dissertation was about Hertzian waves, received his Ph.D. from Yale in 1896. His first job was with Western Electric. By 1902 he had started the DeForest Wireless Telegraph Company, which became insolvent in 1906. His second company, the DeForest Radio Telephone Company began to fail in 1909. In 1912 he was indicted for using the mails to defraud by promoting "a worthless device," the Audion tube. He was acquitted. The Audion tube (later known as a triode tube) was far from being a worthless device, as it was a key component of radios so long as vacuum tubes continued to be used. "Of all the members of the early wireless [radio] engineering fraternity, perhaps Lee deForest, more than any other, had some vision of the broadcasting potential of the wireless telephone." [Sivowitch 11] Because in the late nineteenth century the new electrical industry had made some investors multimillionaires almost over night, Americans like deForest and his partners found easy pickings for awhile, as many people were eager to snap up the stock offered by overly optimistic inventors in this new branch of the electrical industry. The quick failure of firms whose end, rather than their means, was selling stock made life more difficult for surviving, ethical firms. DeForest was twice defrauded by his business partners. Some of deForest's associates, but not deForest, were convicted of stock fraud. However, in a revealing entry in his diary, deForest wrote that "soon, we believe, the suckers will begin to bite. Fine fishing weather, not that the oil fields have played out. 'Wireless' is the bait to use at present. May we stock our string before the wind veers and the sucker shoals are swept out to sea." [G. Douglas 100] Like Fessenden, deForest experimented with broadcasting. Unlike Fessenden, he stayed in the radio business, but his subsequent radio ventures and a later sound movie venture also failed. DeForest clashed in court, not only with Marconi, but also with Edwin Armstrong in what was the most controversial of all radio patent litigation. Although the court ruled in deForest's favor, the radio engineering fraternity continued to believe that Armstrong had been the first to discover the feedback effect. The Audion was the most important of deForest's over 300 patents. He eventually gave up being an entrepreneur and sold his patents to major communications firms, mainly the American Telephone & Telegraph Company. Edwin Howard Armstrong (1890-1954) decided to become an inventor when he was fourteen years old. His first major invention, the regenerative circuit, was made while he was a junior at Columbia University. He patented it in 1913 and licensed it to the Marconi Company in 1914. After obtaining a degree in engineering, he became an instructor at Columbia. Commissioned as an officer in the Army's Signal Corps, he was sent to France where he invented the superheterodyne circuit that became the basic circuit used in the great majority of radio and television sets. After returning to Columbia in 1920, he sold the rights to the two major circuits he invented to Westinghouse Electric and Manufacturing Company. 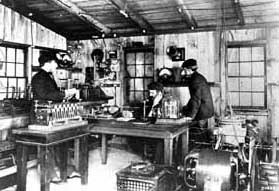 Using his superheterodyne receiver, in 1920 Westinghouse started the nation's first radio station, Pittsburg's KDKA. Later, for stock, Armstrong sold his superregenerative circuit to RCA. In 1923 he married David Sarnoff's secretary. Even after he became a millionaire, he continued to serve as a professor at Columbia. In the 1920s Armstrong became entangled in a struggle to control radio patents. In a courtroom battle that lasted nearly a twenty years, deForest succeeded in overturning Armstrong's 1914 feedback patent in favor of his. The technical community attributed Armstrong's loss in the Supreme Court to the judges' failure to understand the technical data the case involved. Armstrong solved radio's last major problem, static, with frequency modulation (FM). He successfully tested it in 1933. He discovered multiplexing when he learned that a single FM carrier wave could transmit two radio programs at once. During World War II he did important research on long range radar and gave his FM patents to the government for free. (FM was important to the military because it couldn't be jammed like the AM the Germans used.) A significant characteristic of FM as compared with AM is that FM stations do not interfere with each other. Radios simply pick up whichever FM station is the stronger. This means that low-power FM stations can operate in close proximity. Because RCA refused to continue to support his FM work, he sold some of his stock and built his own FM station in New Jersey. In addition to opposition from RCA, Armstrong was hindered by a Federal Communications Commission (FCC) spectrum reallocation. Armstrong expected to receive royalties on every FM radio set sold and, because FM was selected for the audio portion of TV broadcasting, he also expected royalties on every TV set sold. Some television manufacturers paid Armstrong. RCA didn't. RCA also developed and patented a FM system different from Armstrong's that he claimed involved no new principle. So, in 1948, he instituted a suit against RCA and NBC, charging them "will willfully infringing and inducing others to infringe five of the basic FM patents." [Erickson 119] It was to RCA's advantage to drag the suit out. It had more money than Armstrong did, and it could make more money until the case was settled by selling sets utilizing technology Armstrong said was him. Hopefully, it could do this until his patents ran out. To finance the case and his research facility at Columbia, Armstrong had to sell many of his assets, including stock in Zenith, RCA, and Standard Oil. By 1954, the financial burden imposed on him forced him to try to settle with RCA. RCA's offer did not even cover Armstrong's remaining legal fees. Then Armstrong struck his wife, who left him, when she refused to give him some money he had given her earlier. He walked out the window of his thirteenth-floor apartment on February 1, 1954. Sarnoff denied responsibility for Armstrong's suicide. Armstrong's widow settled with RCA. All of the radio pioneers profiled in this article were very intelligent, and even the one with the least formal education, Marconi, was well educated for his day. The others had vastly more formal education than does even the average person today. Typically they began inventing things as teenagers. Among them holding hundreds of patents was common. Some of these patents were for the most important inventions of their day. So it would seem that these men were well positioned to become extremely wealthy. Some of their peers chose to settle for good salaries working for others. They, by becoming entrepreneurs, chose to leap for the brass ring. Most fell short. Cynics would probably conclude that they just didn't know how to play the business game. Although relatively few entrepreneurs are inventor/entrepreneurs, many other entrepreneurs are bifurcated; it's just in other ways. The book lover may open a book store. The camera enthusiast may operate a photo studio. The art lover may open a gallery. The sports fan may sell athletic gear. The carpenter may run a cabinet-shop. Today it is becoming clear that many dot com entrepreneurs were mistaken about where the real market for the internet lay. Marconi, too, was mistaken about where the real market for his service lay. Technological problems were the first road block to the development of the best market for radio: broadcasting. Today technological problems stand in the way of making buying on the Web a very popular alternative to brick and mortar stores. Like the phonograph, radio replaced the piano in the parlor. Virtual shops seeks to replace the shopping mall. The second road block to the creation of the broadcasting industry was financing it. In Europe the government made it a government monopoly and financed it. In the United States advertising financed it. Like newspapers, radio, and television, Web purveyors of information and entertainment have turned to advertising to cover their costs. The see-sawing between wire and wireless methods of communicating that the radio and television industries have experienced is developing in regard to computers and the Internet. The experience of the inventor/entrepreneurs in the early radio industry suggests that it is very difficult to be this type of bifurcated entrepreneur. Striking out on one's own is appealing to an inventor because it is a way for him or her to make more money, finance new inventions, and control the use of existing ones. However, an inventor's mixed motives may either be a blessing or a curse. While a life-long fascination with science and engineering provides a motivation to develop new, high-tech products and services, it appears that the qualities that make people inventors of high-tech products may not be accompanied by, or may even conflict with, the attributes necessary to successfully create and manage a business. That the inventor/entrepreneur's business is patent-based is a mixed blessing, as the fact that it provides a monopoly may be largely offset by the cost of defending it, particularly if the challenger is a large, well-financed corporation. As an industry where significant economies of scale exist matures, you can be sure that large competitors will come onto the scene by the growth of formerly small firms and/or the entry into the industry of large firms in other industries. The radio inventor/entrepreneurs were handicapped, of course, by the fact that there was not available to them the kind of venture capital market their high-tech peers today can tap. Another sometimes handicap was the special interest of the government in all the electrical industries and the resulting regulation of them. Regulation was, however, a mixed bag. The FCC's spectrum reallocation that cost Armstrong a lot benefited RCA. When he was Secretary of the Department of Commerce and Labor, Herbert Hoover claimed that the radio industry wanted to be regulated, as the various broadcasters could not work out spectrum allocation among themselves. When in the future we look back at the careers of the inventor/entrepreneurs who founded computer-related firms will we find that bifurcation was more readily handled by them than it was by the radio inventor/entrepreneurs? Can or will they learn from the experience of their predecessors? Navigable waterways present no free speech problem, but radio and television do. So, one of the early issues the government had to decide was whether radio would be allowed the same freedom of speech that newspapers and magazines have. Another issue that had to be settled was whether radio stations were to be treated as common carriers as the telephone companies were. From radio's earliest days there was widespread agreement that spectrum scarcity and the possibility that one station would drown out the transmissions of another one meant that government regulation was necessary. It chose to limit the number of stations, not by charging a high price for a broadcasting license, but by limiting the number of free licenses granted. The number of economically viable radio stations that can exist differs greatly between various geographically equally-sized areas. In the early years of broadcasting, it was not economically feasible to locate even one radio station in many rural areas. Therefore, some stations located in cities, called clear channel stations, were allocated enough power to reach distant, rural areas during prime listening hours at night. Local stations broadcasting on these stations' channels (frequencies) were forbidden to broadcast at night. The clear channel stations' reach was substantial, not only because they were allowed more powerful transmitters, but because radio waves travel further at night. Some claimed that it was because population density was much greater in the Northeast than in the rest of the country, and this was the wealthiest region, that the more expensive and powerful stations were clustered in this region. However, Southerners and Westerners argued that this was the result of favoritism by the Department of Commerce and Labor. Their complaints forced the government to scatter clear channel stations throughout the country. Because radio waves cross international borders, international agreement on frequency assignments was necessary. In Europe broadcasting was a government monopoly until after World War II, and European governments pushed hard for broadcasting to be restricted to a very few frequencies. Because in the U.S. broadcasting was dominated by private interests, the U.S. refused to bend to this demand, and it got its way. Economies of scale in programming led to broadcasting networks being established. They were limited by the government as to how many stations they could own. The ownership of a chain of station was economically advantageous. Only a few networks proved to be economically viable in radio and, later, in television. Network broadcasting is an oligopoly because each network has the potential for taking a lot of business away from its competitors; therefore each network must take into account what the other networks are doing. However, through targeting different audiences, each network can gain some pricing independence in setting its advertising rates. The economic, financial, and regulatory structure established in the radio industry was carried over into the television industry. In the early years of radio some contended that spectrum scarcity made radio a natural monopoly, and for this and other reasons, including how it could otherwise be financed, it was advocated that radio be monopolized by the government. Although today it may seem obvious that it can be financed by advertising, this was not initially thought to be possible. It did not, however, take long for advertising to become the method for financing broadcasting. The Republicans' capture of Congress prevented a bill calling for government ownership from passing, and this idea was dropped after Wilson was replaced by a Republican president. However, during the administration of Democrat Franklin D. Roosevelt a weak attempt was made to nationalize broadcasting. Subsequently the political issue was how strictly broadcasting would be regulated. Herbert Hoover, who prior to being elected president of the U.S. was head of the Department of Commerce and Labor, which at that time issued radio licenses. He believed that if laissez faire had ever been America's economic philosophy, it was long dead by 1920. The rise of industry, he observed, had been paralleled by the rise of regulation and social responsibility, neither of which was compatible with laissez faire. He advocated a new economic system midway between capitalism and communism. Therefore, he took it upon himself to try and work out some form of public-private cooperation in the radio, aviation, and electrical power industries that would reduce the risk of investment, open up large markets, and guide these industries' development along constructive lines. Baker, W. J. A History of the Marconi Company, 1971. Barnouw, Erik. A Tower of Babel: A History of Broadcasting in the United States, 1966. Bennett, William B. The American Patent System, 1943. Broadcasting Magazine editors. The First 50 Years of Broadcasting, 1982. Cheney, Margaret. Tesla, Man Out of Time, 1981. Douglas, George H. The Early Days of Radio Broadcasting, 1987. Douglas, Susan J. Inventing American Broadcasting 1899-1922, 1987. Dunlap, Orrin E. Marconi, The Man and His Wireless, 1937. Erickson, Don V. Armstrong's Fight for FM Broadcasting: One Man vs Big Business and Bureaucracy, 1973. Everson, George. The Story of Television: The Life of Philo T. Farnsworth, 1949. Gitelman, Lisa. "Reconciling the Visionary with the Inventor," MIT's Technology Review (Nov./Dec. 1997), pp. 66-68. Hawley, Ellis W., ed. Herbert Hoover as Secretary of Commerce: Studies in New Era Thought and Practice, 1981. Head, Sydney W. and Christopher H. Sterling. Broadcasting in America, 1982. Hindle, Brookes. Emulation and Invention, 1981. Hunt, Inez and Wanetta W. Draper. Lightning in His Hand: The Life Story of Nikola Tesla, 1964. Jolley, W. P. Marconi, 1972. Krasnow, Erwin G., Lawrence D. Longley, and Herbert A. Terry. The Politics of Broadcast Regulation, 1982. Leasing, Lawrence. Man of High Fidelity: Edwin Howard Armstrong, 1956. Lewis, Tom. Empire of the Air: the Men Who Made Radio, 1991. Lichty, Lawrence W. and Malachi C. Topping, eds. American Broadcasting: A Source Book on the History of Radio and Television, 1975. Lyons, Eugene. David Sarnoff, 1966. MacLaurin, W. Rupert. Invention and Innovation in the Radio Industry, 1971. Passer, Harold C. The Electrical Manufacturers, 1875-1900: A Study in Competition, Entrepreneurship, Technical Change, and Economic Growth, 1953. Reade, Leslie. Marconi and the Discovery of Wireless, 1963. Scott, Carole E. "Radio and Television Broadcasting" in Infrastructure and Services, A Historiographical and Bibliographical Guide, David O. and Bessie E. Whitten (Eds. ), II, 3. Passer, Harold C. The Electrical Manufacturers 1875-1900, 1953. Rosen, Philip T. The Modern Stentors, 1980. Schwarts, Evan I. "Who Really Invented Television?" Technology Review (Sept./Oct. 2000), 96-106. Seitz, Frederick, Cosmic Inventor: Reginald Aubrey Fessenden 1866-1932, 1999. Sivowitch, Elliot N. "A Technological Survey of Broadcasting's 'Pre-History' 1876-1920," Journal of Broadcasting (Winter 1970-1971). Seifer, Mark J. Wizard: The Life and Times of Nikola Tesla: Biography of a Genius, 1998. Sterling, Christopher H. Electronic Media, 1984. Sterling, Christopher H. and John M. Kittross. Stay Tuned: A Concise History of American Broadcasting, 1978. Swartz, Evan I. "Who Really Invented Television?" Technology Review (Sept./Oct. 2000), pp.96-106. Tesla, Nikola with Ben Johnston. My Inventions: The Autobiography of Nikola Tesla. 1982. U.S. Senate Committee on Interstate Commerce, Testimony, 69th Congress, 1st Session, 1 and 2 March 1926, Part 3, 243-244.